1. Soak the quinoa in warm water. Marinate the chicken breast with garlic, salt, pepper, thyme, cajun spice, and olive oil; and pan sear it. Cut the zucchini slices into long, flat strips, and blanch it. 2. To make the Lyonnaise, take par boiled potatoes, sauté onions in oil until caramelised, season it with salt and pepper, and add some jus. Once the chicken is cooked, plate the food with quinoa salad, Lyonnais, and zucchini. Serve it with thyme jus. 1. Make a paste of basil leaves, garlic, and pine nuts. Remove the skin of seabass and bake it at 180°C for 15 minutes to make it crispy. 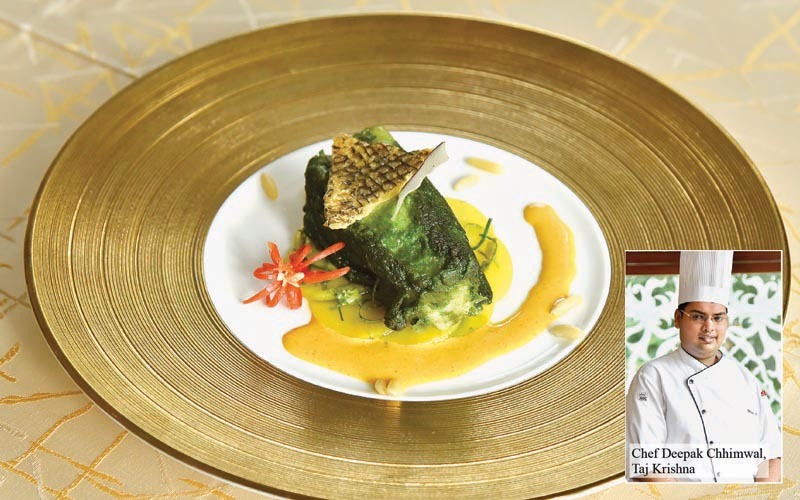 Marinate the seabass with the paste, jeera powder, salt, and ginger-garlic paste; and keep it aside for 30 minutes. 2. Cut the potatoes into thin slices and boil with turmeric and salt. Toss it with shredded curry leaves, mustard seeds, and turmeric. Slice the onions, tomatoes, green chillies, raw mango, and ginger. Sauté all the vegetables in oil, and add turmeric and red chilli powder. 3. Add water and the fine paste of fresh coconut. Cook for half an hour, adjust the seasoning, and then strain it. Sear the seabass on a tawa, cover it, and let it cook. Serve the seabass with the potatoes, pour the gravy, and garnish it with the crispy skin, pine nuts, and a slice of coconut.